In this section we will provide you with information about the time characteristics of the GSR response and why you need to take them into consideration when designing a GSR experiment. We define the response time of a physiological signal as the time it takes to change its characteristics as a consequence of an external event or stimulus. Some physiological signals, like EEG, have millisecond response time (e.g., a visual brain reaction can be measured with EEG after only 50ms of the visual event onset). This is considered a high time resolution because the EEG changes can be related with confidence to the stimulus that caused it. For a GSR signal, the response time is of the order of seconds after an event has occurred, which we consider a low time resolution. Thus, it is important to take into consideration the GSR time characteristics during the experimental design. When there is an emotional reaction to an external event (e.g., visual stimulus), the phasic or rapid component of the GSR signal increases its amplitude temporarily, which is known as skin conductance response (SCR). This will not happen instantaneously, but with a certain delay or latency after the emotional event occurred. SCR latency varies within and between individuals. 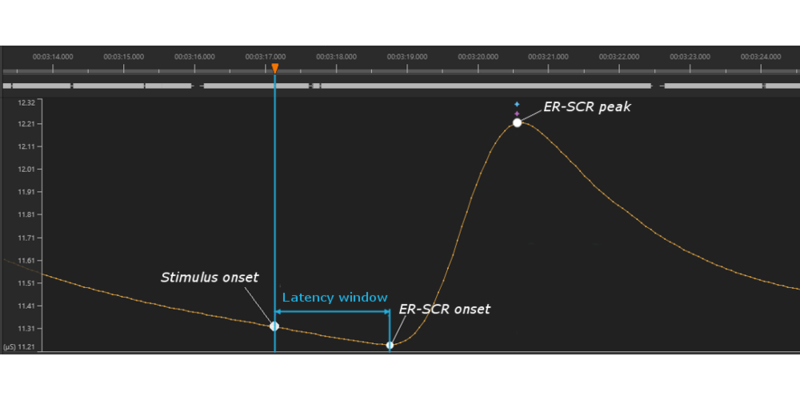 Current literature takes into account this variability and suggests a latency window of an SCR that spans from 1 to 5 seconds after the event onset. In other words, an SCR in response to an emotional event will start between 1 second and 5 seconds after the event begins. Figure 1. SCR latency window. The SCR latency window creates an uncertain time period. If several events that can cause an emotional response occur during this latency window, it will not be possible to know which event caused the SCR. Therefore, when designing a visual experiment that will use GSR to study SCR to specific events (known as ER-SCR), it is important to display the stimulus for enough time to make sure that an SCR can be associated with the stimulus of interest, and ensure that SCRs do not overlap. A common minimum stimulus duration time is around 10 seconds, with similar inter-stimulus-interval durations. In recent years, there has been some research that aims both to improve methodologies allowing for shorter inter-stimulus-intervals and to propose advanced analysis tools that can achieve a better SCR parametrization when SCRs overlap (e.g., Alexander et al., 2005; Benedek & Kaernbach, 2010). The tonic or slow component of the GSR signal will also change its amplitude over time due to general arousal level or stress. The GSR signal amplitude increases when we are under stress and decreases as we relax. Arousal level variations are also quite slow and happen over the course of tens of seconds to minutes. 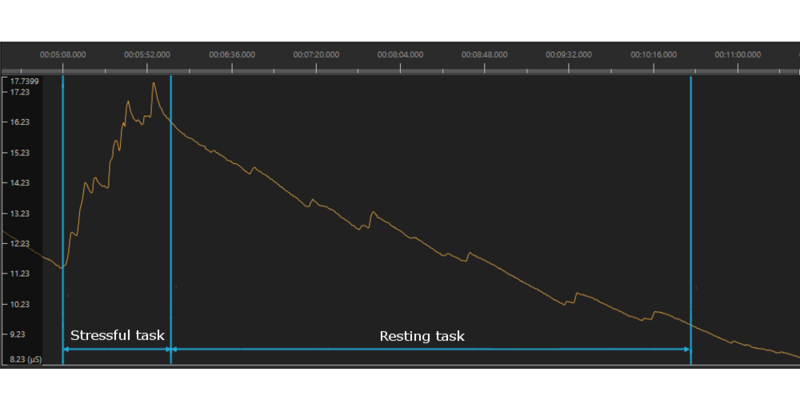 When using GSR to study general arousal level or stress, it is also important to take into consideration the tonic response time by designing tasks that are long enough to allow for GSR amplitude variations in response to the stress level that the subject is experiencing. Figure 2. General arousal level response time.